TouchBistro works with a number of payment processors, including: Chase Paymentech, Moneris, PayPal, Vantiv, Square, Premier Payments, and Cayan (and outside of the US, iZettle and Tyro). Your pricing for credit card processing will depend on which processor you use and the rates available to you. See TouchBistro's list of partners for more information on card processing. TouchBistro is unique in how it's set up - instead of being cloud based, like the majority of iPad software, it's installed locally. This means that TouchBistro doesn't require WiFi for day to day software operations, although you will need an internet connection for credit card processing (and even though some payment processors allow for offline card processing, including Square and Moneris, you'll still need to process cards online). If you have more than one iPad station, you will need to set up your server on a Mac Mini (if you are only using one iPad, it will run off of that iPad). Storing all your data locally makes TouchBistro more secure than cloud-based software, but requiring a physical server also limits TouchBistro's functionality for mobile businesses such as food trucks. The only parts of TouchBistro that are available via the cloud are reports and data management. TouchBistro is compatible with thermal and impact (kitchen) printers, as well as kitchen display systems, printer driven cash drawers, and Bluetooth barcode scanners. For more information on setting up hardware with your TouchBistro system, there is a series of videos with step by step instructions on TouchBistro's website. Receipt Printers - TouchBistro is compatible with Star Micronics brand Ethernet interface printers, including the TSP100III, the TSP650II, and the impact (kitchen ticket) SP700. TouchBistro is also compatible with certain Epson brand Ethernet printers, but you have to contact TouchBistro directly to purchase these, as they require specific models. Kitchen Display - If you choose to use a kitchen display system instead of a kitchen ticket printer, TouchBistro supports using an additional iPad as a KDS. Cash Drawer - TouchBistro is compatible with printer driven cash drawers. They officially list the MMF Val-u-Line as the compatible cash drawer, but any printer driven cash drawer that is compatible with your receipt printer should work. Barcode Scanner - TouchBistro supports using the Socket CHS 7Ci Bluetooth barcode scanner, if your business sells products with barcodes. You can also use the iPad camera to scan barcodes, although this inputs barcodes slightly differently than the Socket scanner, so if you switch from using the iPad camera to the Socket scanner, you will have to re-input your barcodes. TouchBistro includes a huge number of features, so in this section, we're only going to highlight the ones we think make TouchBistro stand out (for a full list, see their website). The main feature that distinguishes TouchBistro from others is that it's designed to be used tableside. Although you can use TouchBistro on a single iPad (for counter service restaurants, cafes, etc), it's set up so that servers can bring the iPad to the table with them to take orders, eliminating a step in the order-taking process (see image to the right). Many of the features are specifically built to be used tableside, including credit card processing. TouchBistro stands out with a couple of factors: the way of taking orders and the local (and not cloud-based) set up. The tableside ordering system makes placing and sending orders quick and direct. Local storage and set up is a safer way to store your data, but also makes your business less mobile. If these two factors are appealing and seem like they suit your restaurant, we highly recommend TouchBistro. If either of these features, however, don't seem like they work for your business - if, for instance, you have a mobile restaurant like a food truck, or you won't take advantage of the tableside ordering - there are other iPad point of sale systems that may work better for your restaurant. For other iPad software options, we suggest considering Aldelo Touch restaurant software, or Square for food trucks, or ShopKeep for counter-service restaurants or cafes. In addition to this, we feel that TouchBistro is better suited for small and medium restaurants. 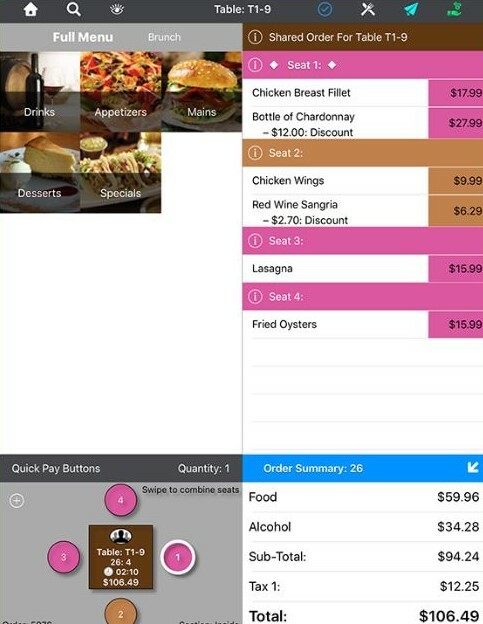 Larger restaurants may struggle with some aspects of TouchBistro, including the inventory management features (which also impact any restaurant with a very large menu). TouchBistro does offer an unlimited licenses option though, and there are increasingly more features available for larger restaurants. Finally, keep in mind that TouchBistro is constantly updating and adding new features. The ingredient-level inventory management feature, for instance, was recently added, and TouchBistro emphasizes their goal to make their software as user friendly as possible. In this same vein, TouchBistro has a series of step by step videos on how to set up your system, your hardware, and your staff that are available on their website. They also offer 24/7 customer support via phone and email, as well as an online help portal. The support at every level and integration of new features help make TouchBistro a very good choice for small and medium sized restaurants.